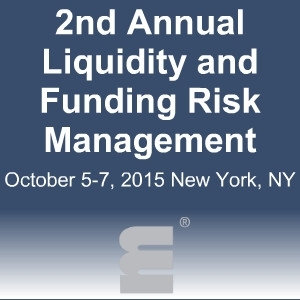 New York, NY–May 2015–GFMI, a leader in knowledge sharing for capital markets, will host the 2ndAnnual Liquidity and Funding Risk Management Conference on October 5-7th, 2015 in New York, NY. Building on the success of the previous edition, this year’s meetingwill demonstrate how by optimizing liquidity management banks will always be able to meet their financial short-term and long-term obligations, hence operate effectively and profitably and satisfy the regulators. Via case study presentations, our expert speaker panel will examine in depth the calculation, disclosure and reporting of the LCRwith attendees. The NSFR will also be evaluated to make banks better prepared for its implementation when it is finalized later in the year. The impact of the SLR will be discussed to assess its impact on liquidity management. The event will demonstrate how by optimizing liquidity management banks will always be able to meet their financial short-term and long-term obligations, hence operate effectively and profitably and satisfy the regulators. GFMI is a specialized provider of content-led conferences for the financial markets. Carefully researched with leading financial market experts, our focused quality events deliver key bottom-line value through targeted presentations, interactive discussions and high-level networking opportunities.